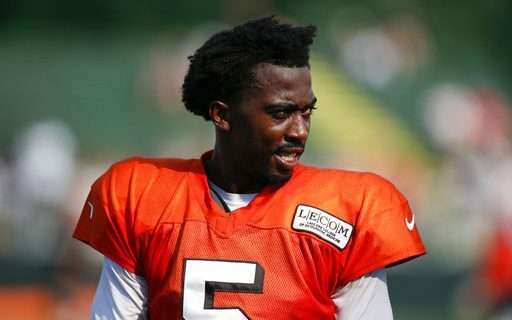 Tyrod Taylor is now the starting quarterback for the Cleveland Browns, after three years with the Bills. While the Lake Erie cities are similar in many ways, sports humorist Jeff Wozer discovered the biggest differences that Taylor has noticed between the two teams and cities. Easier to focus in Cleveland without the distraction of Fantasy Island. Browns management has no objections to him using JUGS machine to pick off crows. Feels quicker in Cleveland thanks to no helmet logo wind drag. Unlike Terry Pegula Cleveland owner Jimmy Haslam, when carpooling to work, offers gas money. Instead of super fan Pancho Billa, Cleveland has some drunk guy named Doug from Dayton. Can finish 1 – 15 and be viewed as more successful than last season. Unlike McDermott after games Hue Jackson takes players to Dairy Queen for Dilly Bars. No longer has quick access to stock tips from Chris Collins. Cuyahoga County Fair’s bearded lady is hotter looking than Erie County’s. Easier to focus on his life’s true purpose: get Duran Duran into the Rock and Roll Hall of Fame. Jeff has also uncovered the top rejected Buffalo Bills ice cream flavors and the biggest differences Brian Daboll has noticed between Sean McDermott & Bill Belichick.